Winchester Palace, located in present-day Southwark about 250 meters west of the London Bridge, served as the London residence of the Bishops of Winchester during the Middle Ages. While the west wall remains standing, the other three stone walls were found in the nearby St. Mary Overy Wharf. Underneath the hall was an undercroft cellar that was primarily used to store goods such as wine. Fundamentally characteristic to all medieval palaces, Winchester Palace also had three wharfs that granted the bishops access to Westminster via the River Thames. 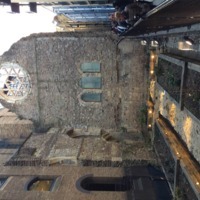 Photo by Suzanne Forlenza, “Winchester Palace (the ruins, in 2015),” Medieval London, accessed April 22, 2019, http://medievallondon.ace.fordham.edu/items/show/135.